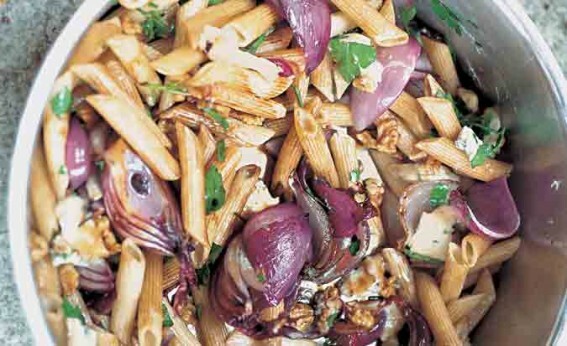 The combination of sweet onions, blue cheese and walnuts is irresistible. Cut each onion half into crescent-shaped slices, about 1.5cm (⅝in) thick. Toss in a roasting tin with the olive oil, balsamic and seasoning. Roast at 190ºC/375ºF/gas mark mark 5 for 30–35 minutes, shaking the tin every so often. The onions should be tender and slightly charred. Cook the pasta, drain and return it to the saucepan. Add the onions and the rest of the ingredients. Stir and serve.